WQED-FM's Senior Executive Producer Jim Cunningham hosts the WQED-FM "Morning Show" weekdays from 6 to11 a.m., and the nationally syndicated "Pittsburgh Symphony Orchestra." He is the classical music critic for "Pittsburgh Magazine," where he contributes a monthly column. He has produced and hosted over 30 features for WQED-TV's nightly "On Q Magazine." Cunningham has traveled as a correspondent with the PSO on 12 world tours to Europe, Japan, South America, Australia and the Orient. 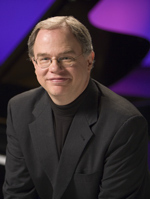 In addition to serving as host and producer of the Pittsburgh Symphony's radio broadcasts, he has hosted over 100 pre-concert talks for the orchestra's concerts in Pittsburgh at Heinz Hall in Midland, Pa., and at the Royal Albert Hall in London before a Promenade Concert. As the presenter for PSO's "Unlocking the Classics" series, he has spoken to music lovers at area libraries. His work has earned numerous Golden Quill Awards from the Press Club of Western Pennsylvania, the Air Award from March of Dimes, the Gabriel Award from U.S. Catholic Broadcasters, the Opera Theater of Pittsburgh's Millie Award and the Board of Directors of Chatham Baroque.